Everyone loves a good plot twist. It jolts the story in an unexpected direction and gets your adrenaline pumping as you sit up and wonder what’s going to happen now. For writers, plot twists can be a little tricky to handle. You want them to be genuinely surprising yet not so out-of-the-blue that readers scratch their heads and wonder “WTF?” instead of eagerly turning the page to see what comes next. ñ Plot twists are hard to plan in advance. If you’re a plotter rather than a pantster, you can work in some twists and turns as you plan out your plot. Personally, though, I find this hard to do. Some of my best plot twists have appeared when I wrote a scene, expecting it to go a certain way, but then events took a turn I hadn’t anticipated. I’ll be zeroing in on the last few lines of the scene, and one of the characters will say or do something completely unexpected. I love it when this happens — it energizes my writing and makes the story feel suddenly fresh. ñ Don’t fight a good twist. On the other hand, it can be disconcerting when a story takes an unexpected turn as you write. If you’ve taken the time to map out the plot, it might feel like everything’s suddenly in disarray. Don’t jettison a twist just because it doesn’t fit your outline. Instead, take some time to play with the outline and see where things might go now that the twist has appeared. ñ Need a twist? Ask “what if?” Often, the next thing that happens in a story is the obvious thing — but for readers, following an obvious chain of events isn’t very exciting. If you’re at a juncture where your story could use a good twist, try this: In a single sentence, write down what you think will happen next. Then write 25 alternatives. Ask yourself “What if?” to come up with possibilities: “What if the letter never arrives?” “What if the character gets fired?” “What if the building they’re about to investigate burns down?” Twenty-five alternatives may seem like a lot, but pushing yourself to think of so many possibilities lifts your thinking out of whatever rut your story has slipped into. ñ Don’t let a plot twist slow things down. If a twist requires pages of explanation, it’ll bog down the plot instead of speeding the story off in a new direction. When a twist appears, don’t give in to the temptation to quit showing and start telling. This is doubly true when a twist happens at the climax of a novel. Readers expect a climax to be exciting; don’t slow things down to stop and explain or to fill in backstory. Agatha Christie could get away with gathering all the suspects in a drawing room and having her detective explain the final plot twist, but you can’t. ñ Plot twists must seem both surprising and inevitable. This is where you avoid the WTF? Factor, and it happens during revision. When a plot twist shows up, resist the temptation to explain how it happened. (In other words, keep pressing forward instead of going back.) When you write the next draft, tweak the story to set things up for the twist. Again, don’t overexplain. Foreshadow, but don’t bludgeon. ñ Avoid amazing coincidences. An out-of-nowhere coincidence is a sure way to lose credibility with readers. If the characters are thinking or saying, “Wow, I can’t believe it!” your readers are, too. Stop and ask yourself how you could set things up so the twist is not a contrived coincidence but an integral part of the plot. ñ Use diversion. Magicians produce astonishing effects through sleight of hand. Novelists use the literary equivalent. Focus readers’ attention over here while something is happening over there. Don’t hide the latter, but play it down. Then, when the twist happens, readers will believe it because they can see where it came from. ñ Be careful with unreliable narrators. Occasionally I’ll read a book with a first-person narrator who hides things — prior knowledge, events, conversations — from readers. As a reader, I find this incredibly frustrating, and any plot twists that arise from such withheld information feels like a cheat. Much of the pleasure of reading a story with a first-person narrator comes from being inside the character’s head as events unfold. If the narrator knows something, the reader should know it, too. Damn, I knew it. Off now to figure out how to get those penguins into a highrise in downtown Boston . 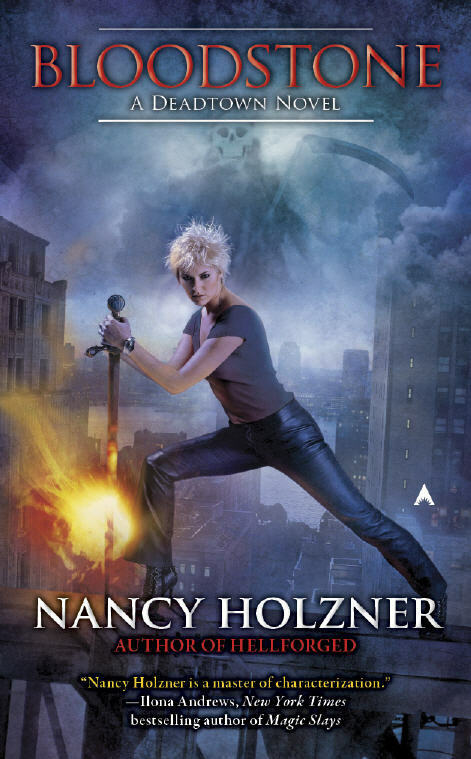 . .
Bloodstone, the third novel in Nancy Holzner’s Deadtown series, is now available. 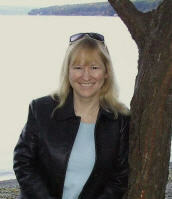 Besides urban fantasy, Nancy also writes mystery; the first book in her Bo Forrester mystery series is titled Peace, Love, and Murder. For information on Nancy and her books, visit her website. You can also find Nancy on Facebook and Twitter, and blogging with other fantasy authors at Dark Central Station. After Vicky banished her demon nemesis to the fiery depths of Hell, she thought life would return to normal. But considering she has a werewolf lawyer boyfriend, a zombie apprentice who’s angling to become a pop star, and an eccentric vampire roommate, what is normal, anyway? Then the supposedly banished Hellion starts to trespass in Vicky’s dreams—just as several of Deadtown’s zombies are viciously attacked and become really dead. When Vicky realizes she’s the only connection between the victims, she suspects that the demon is somehow working through her dreams to become Deadtown’s living nightmare. What she doesn’t know is that her old enemy brings with it a force more terrifying—and deadly—than anything she’s battled before. Gripping the reader from its highly entertaining opening scene, the terrific Hellforged, the second installment in the Deadtown series, maintains that hold until the very end. 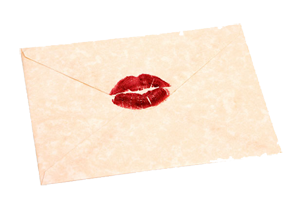 Vicky’s demanding job keeping the city safe from all manner of monsters is one reason her relationship with workaholic lawyer (and werewolf) Alexander Kane is in constant limbo. Throw in a foolhardy zombie apprentice, a mysterious demon-plagued client, and a suspicious research facility that’s taken an unwelcome interest in her family, and Vicky’s love life has as much of a pulse as Deadtown’s citizens. But now Vicky’s got bigger things to worry about. The Hellion who murdered her father ten years ago has somehow broken through Boston’s magical protections. The Hellion is a ruthless force of destruction with a personal grudge against Vicky, and she’s the only one who can stop the demon before it destroys the city and everyone in it. “Ms. Holzner truly delivers with this incredibly solid debut UF novel. Deadtown is told with an authoritative voice starring a great new heroine, and puts an imaginative spin on the usual paranormal suspects; the plotting and worldbuilding are compelling and undeniably fresh. 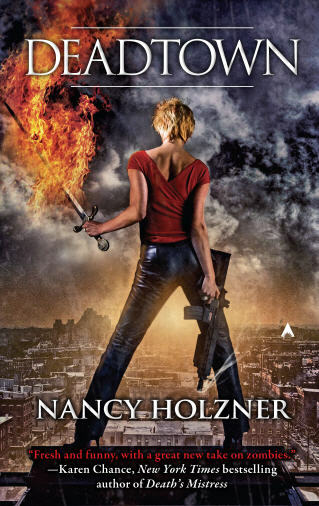 Part demon-busting tale, part political thriller, Holzner’s take on urban fantasy is exciting and fresh. Here’s to the future adventures of Vicky Vaughn! 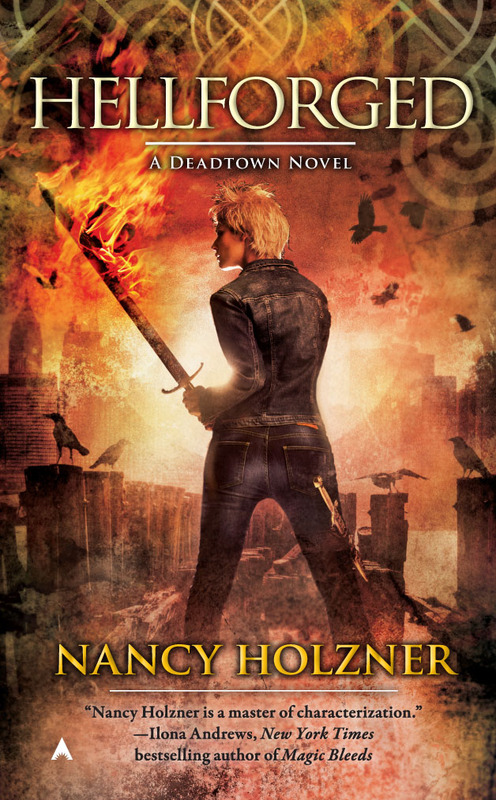 Deadtown is a welcome addition to the urban fantasy landscape. Nancy imbues an emotional aspect into her debut that resonates with our own past prejudices and fears and forces us to evaluate our beliefs about this unreal world in a very real way. There is a lot of great action, social commentary, and a dash of romance in Deadtown. The world building, borrowing heavily from Welsh mythology, is fresh and complex. Vicky is instantly likable and realistically tough yet vulnerable. And I can’t wait to read more. Deadtown was one of the most unique books I have read and I spent an hour gushing to my husband about the world. I am so glad that Nancy brought her monsters out of the closet in Deadtown! Nancy Holzner grew up in western Massachusetts with her nose stuck in a book. This meant that she tended to walk into things, wore glasses before she was out of elementary school, and forced her parents to institute a “no reading at the dinner table” rule. It was probably inevitable that she majored in English in college and then, because there were still a lot of books she wanted to read, continued her studies long enough to earn a masters degree and a PhD. She began her career as a medievalist, then jumped off the tenure track to try some other things. Besides teaching English and philosophy, she’s worked as a technical writer, freelance editor and instructional designer, college admissions counselor, and corporate trainer. Most of her nonfiction books are published under the name Nancy Conner. Nancy lives in upstate New York with her husband Steve, where they both work from home without getting on each other’s nerves. She enjoys visiting local wineries and listening obsessively to opera. There are still a lot of books she wants to read. Thanks, Sarah, for hosting this stop on my blog tour. Personally, I like reading very twisty plots. As a writer, of course, I realize how tricky it can be to write twists that are both surprising and believable. Does anyone have any favorite plot twists? Thanks for guest blogging with me today, Nancy! I really enjoyed your post. I love plot twists too. Although, I can't think of any favorites at the moment.